8 pages. Volume 4, Number 16, dated September 1, 1978. Newsletter / bulletin originally mailed-out to amusement game operators, providing updated info about the coin-op industry. A great historic insight to the industry of the time. 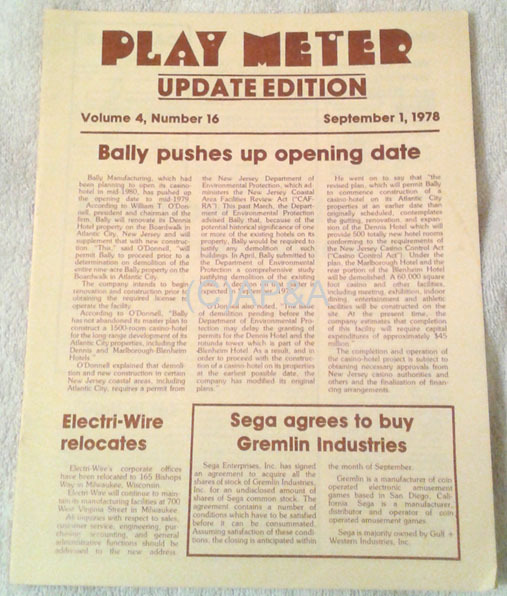 This edition includes information about the opening of the original Bally casino/hotel in Atlantic City, New Jersey, Sega agreeing to purchase Gremlin (thus becoming Sega/Gremlin), AMOA school requirements, national amusement Operators show/convention schedule, tech info and tips, classified ads, and for juke box operators- a listing of the top 100 record/singles- pop, soul, and country for the time ("Grease" by Frankie Valli being listed as the 2nd week at the top position). Original newsletter in like-new condition. Some minor pencil writing on back cover and Operators address label present.